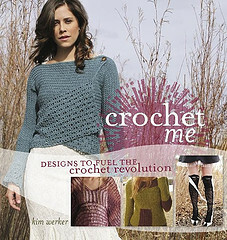 Crochet Me Book Launch: Sunday 14 October! I don't know about you, but these days I need three months' notice to make important plans. So I'm not at all jumping the gun when I kill two birds with one stone and share my total, complete giddiness about the Crochet Me book launch and invite you to join us at the same time. And as an added bonus, I'm throwing down the gauntlet in a similar fashion to the one our favourite Harlot threw down to knitters a few months back. RSVP to WEBS to reserve your spot. And note: Part of my giddiness in announcing the book launch so early is because I think it would be pretty freaking amazing to fill up the huge space. You in? UPDATE: Maryse reminded me that the stupid comments are fubar. I've added the launch to Eventful, so if you can't leave a comment here, leave one there! And then we'll have the added bonus of showing the civilian (read: non-crocheting) world how strong our numbers are. Rock.